Raising a child is a challenge. A father can provide for & protect their children. Studies show that children with early father involvement are more likely to be and stay healthy. Men have an innate desire to protect, care and provide for their children. A father’s care & love adds to a child’s growth, just like a mother’s does. While women are caring & able, there are certain things men can share with their babies to strengthen a child’s development. The Healthy Start Coalition was awarded a five-year grant from the Administration for Children & Families to provide comprehensive fatherhood services to dads in Baker, Clay, Duval, Nassau and St. Johns counties from 2015-2020. The Coalition’s Fatherhood P.R.I.D.E. (Parental Responsibility Inspiring Dads Everywhere) program strengthens and expands fatherhood, employment, housing, health care, mentoring and recidivism reduction services through case management, referrals and group classes. The Coalition established fatherhood as a priority in the 2009-2014 Service Delivery Plan. Due to the growing need for fatherhood responsibility and its impact on maternal and child health, the Coalition has developed a Fatherhood Initiative Task Force for the Northeast Florida region and collaborates with area fatherhood providers. The program builds on the foundations established by the Coalition and the Florida Department of Revenue – Child Support Enforcement Department’s “Bringing Relief, Education and Assets to Children and their Household” Project (BREACH), which ceased services in August 2014. The needs of referred fathers are assessed and addressed through a three-tier case management system, that includes a text message personalized education and reminder system, peer mentorship, group classes and a variety of community referrals, including but not limited to financial literacy classes through Real$ense, employment assistance through the Jacksonville Urban League, fatherhood training using evidence-based curricula from the National Fatherhood Initiative and more. Program and partner agency staff will also receive training on domestic violence and preventing, detecting and reporting child abuse. The Northeast Florida Center for Community Initiatives at the University of North Florida serves as local project evaluator. 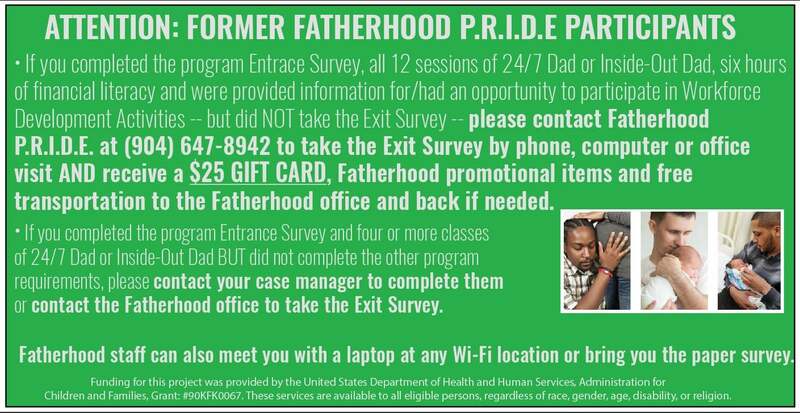 Click here to refer dads to the Fatherhood P.R.I.D.E. program. *Funding for this project was provided by the United States Department of Health and Human Services, Administration for Children and Families, Grant: #90FK0067. **These services are available to all eligible persons, regardless of race, gender, age, disability, or religion. Training on responsible fatherhood and a mother’s role in the father-child relationship was available to men and women through a partnership with the Department of Revenue — Child Support Enforcement Department until September 2014. The training was arranged through the DOR’s Bringing Relief, Education and Assets to Children and their Household Project (BREACH). Case managers were assigned to men and women who were identified by the state for not paying their child support payments or being in arrearage. The case managers assisted them with job training, financial management courses, payment modification, delayed child support enforcement action, a matched savings plan for business/school/home ownership goals for qualified participants and the Coalition’s Responsible Fatherhood and Mom as Gateway programs. From May 2011 to September 2014, nearly 600 fathers participated in 24/7 Dad responsible fatherhood training through BREACH.